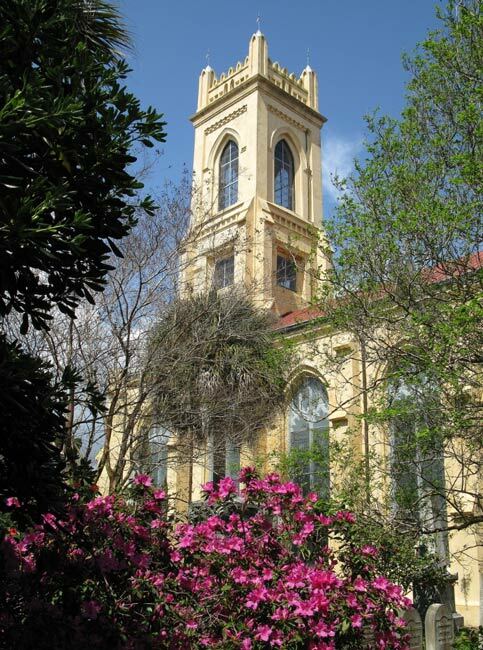 The Unitarian Church in Charleston is the second oldest church building in the Holy City (the oldest is St. Michael’s) and the oldest Unitarian church in the South. The congregation formed in 1772 when the Congregational Church, which at the time gathered in a frame meeting house (hence the name of the street where the church still gathers – Meeting Street), outgrew its small church. A new church of the same denomination, referred to as the Society of Dissenters, was built to house the overflow. Construction on the new church on Archdale Street began that same year but was interrupted by the Revolutionary War. British soldiers stabled their horses within the incomplete church, while Patriot forces used it as a barracks. Construction resumed and was finished in 1787. 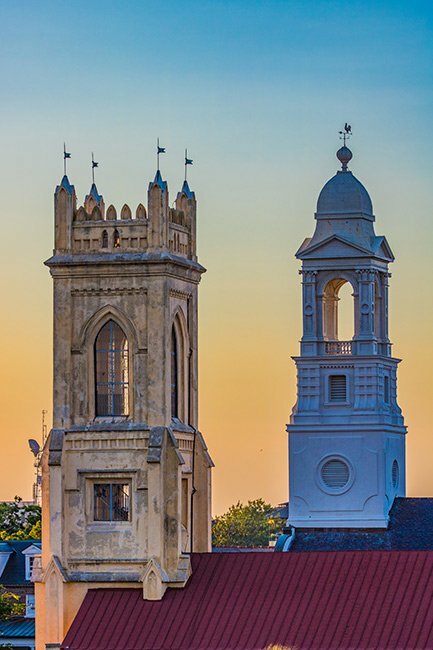 The two Congregational churches – also called Independent churches – initially operated as one, and two pastors alternately served both churches. In 1817 this church was chartered as the Second Independent Church, though its pastor, the Reverend Anthony Forster, was a Unitarian. 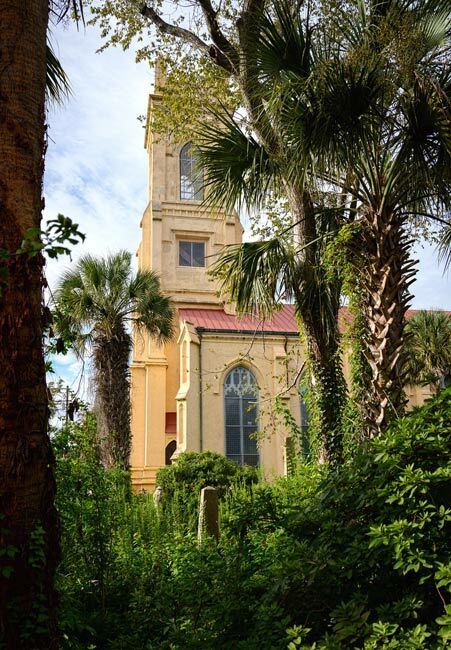 In 1839 it was again chartered, this time as the Unitarian Church in Charleston. Forster’s successor was Dr. Samuel Gilman, a Harvard University alumnus who wrote the school’s alma mater, Fair Harvard. Dr. Gilman served the church from 1819 through 1858. 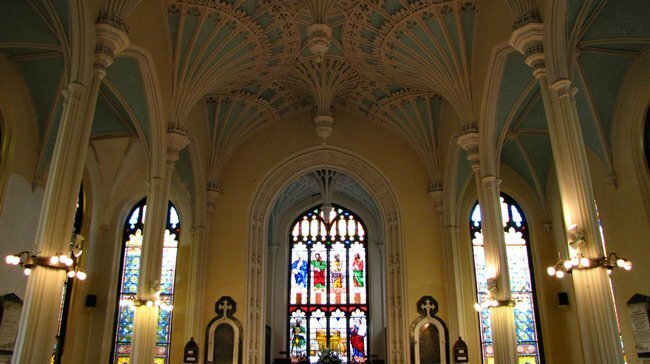 The church acquired its Perpendicular Gothic style in 1852 when architect Francis D. Lee remodeled the church in what was then considered “the new style.” Though Lee made several structural changes that significantly altered the church’s appearance, he worked around the building’s original walls and foundation. 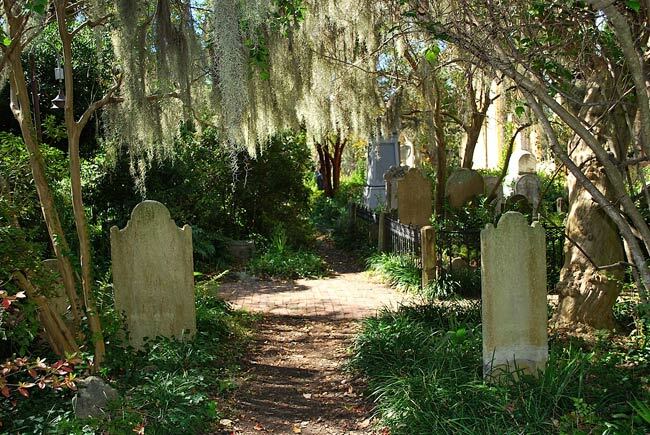 Lee, a member of the firm Jones and Lee, served as a major during the Civil War and also designed Kensington House in Eastover, the Colleton County Jail, the Orangeburg County Jail, and St Mark’s church in Pinewood. The church survived the Civil War, yet suffered damage during the earthquake of 1886. Thanks to the generous donations of Unitarians throughout the United States, the church was fully restored. Fortunately, the church was spared during Hurricane Hugo in 1989. 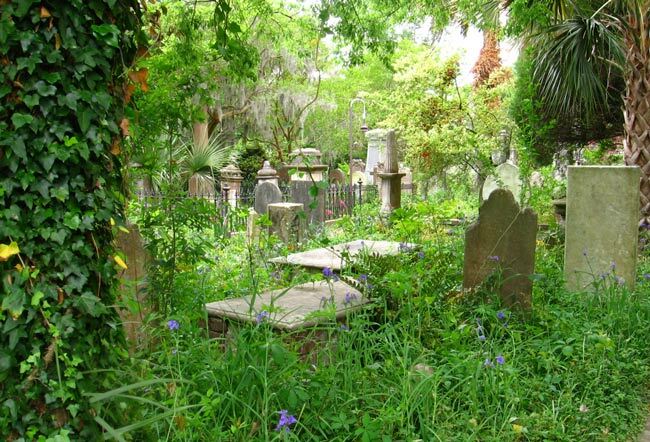 The churchyard (below) is a point of interest, designed by Dr. Gilman’s wife, Caroline. Her idea was to create gardens of native plantings that were allowed to grow freely, mimicking spiritual growth of the church body. In fact, Ralph Waldo Emerson spoke from these gardens in 1827. The church invites visitors to quietly stroll the church grounds and appreciate the timeless beauty of the free-flowing nature that surrounds them. 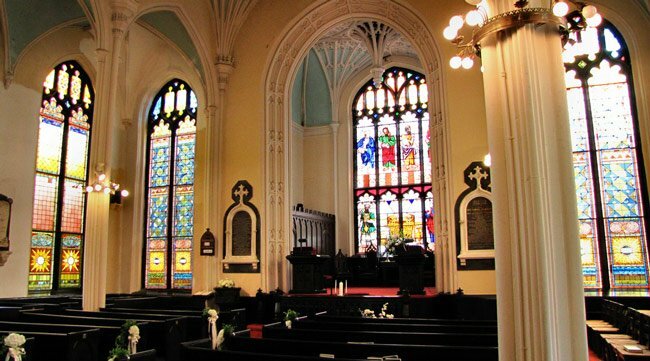 Begun in 1772, the church was gothicized by Francis D. Lee between 1852 and 1854. The building is a good statement of the emotional mood of the mid-nineteenth century when the romantic and picturesque were dominant not only in literature but also in building design. Of Gothic Revival design, the church has a crenellated four-story tower and lancet-arched windows. The main entrance is a Tudor arch, while the eighteen paned lancet arched main tower window has a crocketed hood mould. All windows in the west façade have hood moulds. The building is constructed of stuccoed brick and has false masonry buttresses. 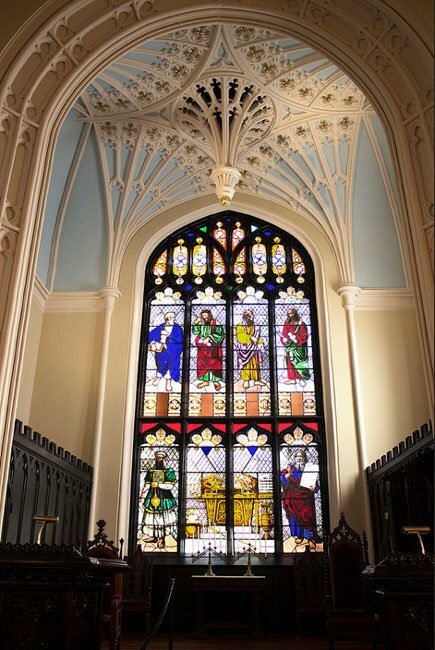 Lee designed the church’s interior to simulate that of the chapel of Henry VII at Westminster. 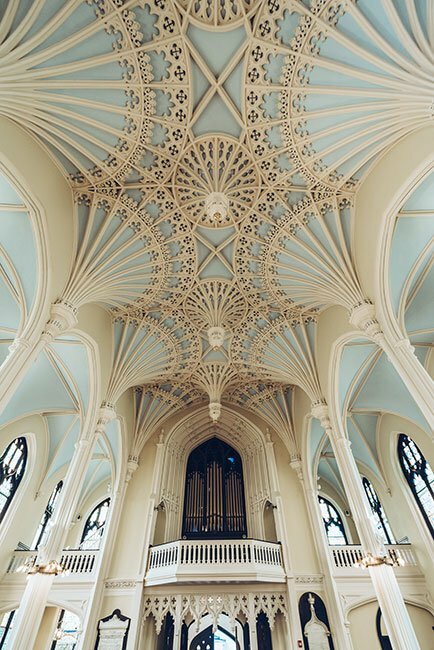 The architect’s use of compound piers to “support” the ceiling and to divide the nave and the aisles is quite good and gives the arches an appearance of soaring to heights that they never reach physically. A great deal of Gothic tracery is used in balustrades and arches within the nave of the church. 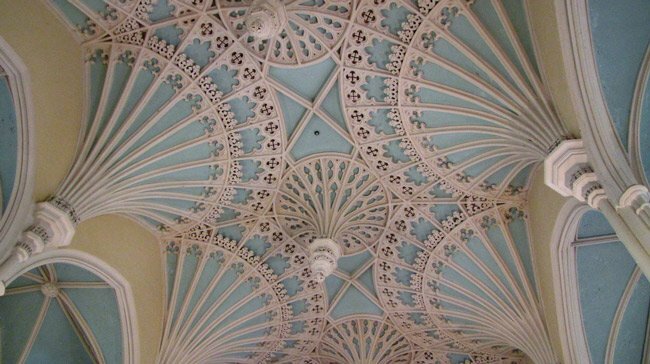 What stunning architecture – and what a beautiful philosophy ! A perfect dream in which to offer worship. Would love to see picture of the whole of the church, both inside and out. My own Unitarian in Great Yarmouth, UK. is an airy, light sanctuary, built in 1954, on simple lines, after the original church was destroyed in WW2. Our church, Old Meeting, sends you its greetings. Hi, Kevin. The website for the church is above the map. Hopefully, someone there can answer your question. Best of luck!